Spotlighting fourteen Berlin art dealers, this exhibition shows the effect of the Nazis’ policy on art on a branch of the economy that had hitherto eluded state control. Documenting the histories of a number of lesser known galleries as well as prominent houses, it looks beyond the Nazi era to also consider the time after 1945 and the (rare cases of) restitution of artworks confiscated in the course of persecution. Many Berlin art dealers were targeted by anti-Semitic persecution and forced to give up their businesses. Not all of them managed to escape Germany in time. Meanwhile, other art dealers profited from the liquidation of their persecuted colleagues’ businesses or became actively involved in the sale of confiscated and stolen art. Another line of business emerged in 1937 with the trade in works of “degenerate” modern art from German museums. Between 1933 and 1945 a process of displacement took place: as a growing number of galleries was forced to close, auction houses did an increasingly thriving trade, auctioning off private art collections and even entire home furnishings, mostly of Berlin’s Jewish residents. The Berlin art trade also profited to the last from the sale of looted art from territories occupied during the war. 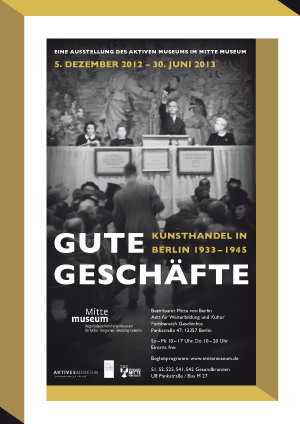 This is the first compilation of art galleries, art dealers, auction houses, auctioneers and appraisers registered in Berlin in the years 1928 to 1943. It is a collaborative project by all Society members, which has not yet been subject to an in-depth appraisal. It should therefore not be viewed uncritically but as a resource for continued research.